Raritan Paragon II P2ZCIM-USB dongles permit users to extend USB keyboard and mouse based computers up to 1000ft away from the desktop Paragon II User Station with use of UTP cabling. Chaining together multiple Z-CIMs allows up to 42 mixed platform PS/2, Sun, and USB computers to connect on a single Cat5 chain by occupying only one channel port on any Paragon II P2-UMT matrix KVM. 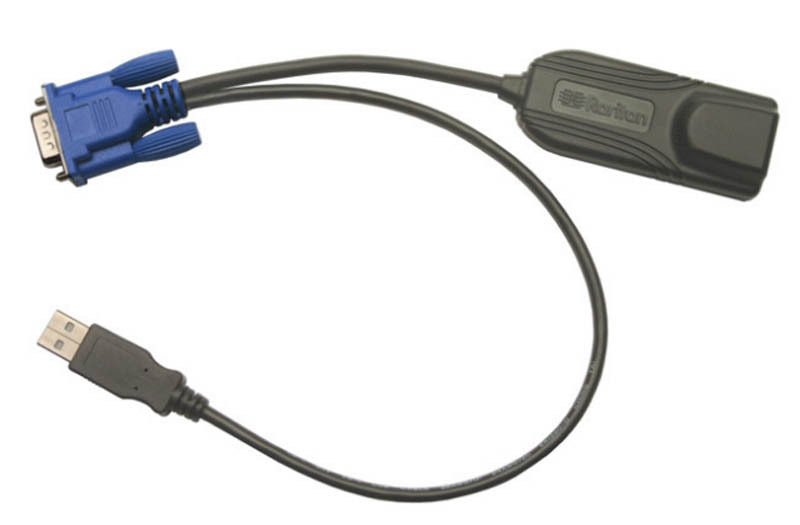 Also referred to as Computer Interface Modules or CIM, P2CIM-SUN dongles store unique server identification for easier configuration and provide keep-alive keyboard/mouse emulation at the target computer. Users will also benefit by witnessing a reduction of bulky cable clutter within server cabinets when implementing the Paragon II Cat5 KVM solution. Limited Stock. Raritan Paragon II P2ZCIM-USB dongles permit users to extend USB keyboard and mouse based computers up to 1000ft away from the desktop Paragon II User Station with use of UTP cabling. Chaining together multiple Z-CIMs allows up to 42 mixed platform PS/2, Sun, and USB computers to connect on a single Cat5 chain by occupying only one channel port on any Paragon II P2-UMT matrix KVM. Also referred to as Computer Interface Modules or CIM, P2CIM-SUN dongles store unique server identification for easier configuration and provide keep-alive keyboard/mouse emulation at the target computer. Users will also benefit by witnessing a reduction of bulky cable clutter within server cabinets when implementing the Paragon II Cat5 KVM solution. Raritan P2ZCIMs are used in conjunction with Paragon II and Paragon I HW3 (running Paragon II code) and support PS2, USB and SUN configurations interfaces on a single CAT5 cable chain, using only one channel port on your Paragon II unit. This can help extend the distances from the main switching unit to the last P2ZCIM on the chain up to 1,000 feet. The first Z-CIM is connected to a computer port on your Paragon II Main Switching or Stacking unit. Servers are linked one to the next using a CAT5 UTP cable. Users can access and control any server connected in the chain via the Paragon II on-screen menu. New servers can be added at any time without interrupting server operation.